In the previous chapter, I argued for the usefulness of Homi Bhabha’s concept of the ‘timelag’ in discussing the intellectual and cultural space which young writers, some of the subjects to which they gave voice and even Ireland and Northern Ireland themselves have come to occupy. 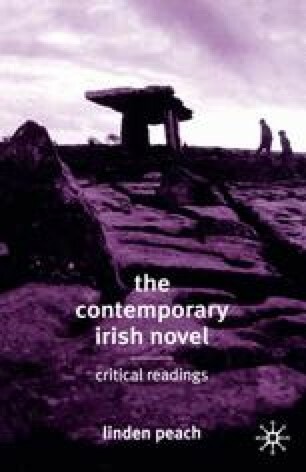 But the notion of the in-between space which they enter, have entered, requires further development of Bhabha’s thesis because what has been previously marginalized or silenced in Irish history has also been shrouded with secrecy. Secrecy has been such a feature of Irish cultural life on a national, local and domestic level that even Bhabha’s vision of the nation state in general marked by ‘internal difference’, most obviously applicable to Ireland, has to be refocused to take it into account. What Bhabha has to say about a ‘timelag’ is also useful in that what has been previously marginalized or concealed challenges the very mapping of the nation. But even here it needs revisioning to acknowledge that in Ireland and Northern Ireland the previously inarticulate or unarticulated challenges our understanding of ‘modern’. Narratives, too, habitually conceal as much as they reveal.